Faculty of Social Sciences and the Warwick Q-Step Centre. Warwick’s Faculty of Social Science has been doing a suite of work around big data this year. ‘Big data’ has become an unwieldy catchphrase loaded with many different connotations. Some researchers argue that big data are transforming everyday social and political processes, locally and globally; others argue that big data has always been around in one way or another. This event will consider the past present and future of data, big and small. The event is aimed primarily at those wanting to learn more about big data in general as well as those wanting to learning more about different social science perspectives about big data. 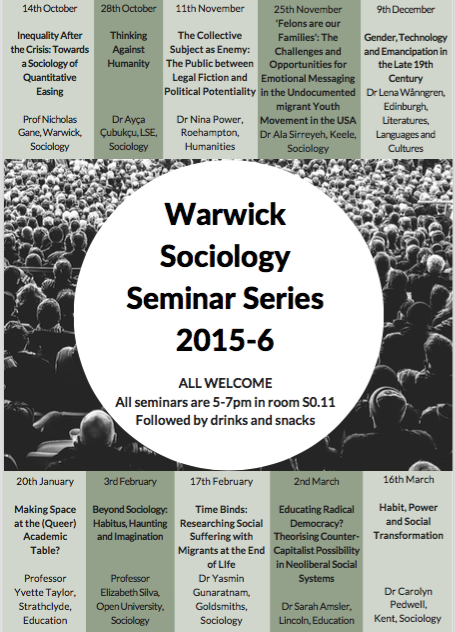 It will include a panel of leading Warwick scholars drawn from across social science disciplines. Rather than giving presentations, panellists will be asked to discuss a number of questions based on some of the key issues we have drawn out of our suite of work around big data. There will then be questions from the audience, which the panellists will be asked to discuss. This will be followed by our keynote speaker, Emer Coleman. 16:00 – 16:10 Welcome Address by Professor Chris Hughes, Chair of the Faculty of Social Sciences; Head of Department, of Politics and International Studies. Emer Coleman – A Warwick alumni now working as a journalist and consultant writing about how technology impacts organisational development. She was the architect of the London Datastore and more recently the Deputy Director for Digital Engagement at Government Digital Services where she wrote the Social Media Guidance for the Civil Service. She was named in Wired Magazines top 100 Digital Power Influencers List 2011. Dr Philippe Blanchard – Assistant Professor at the Department of Politics and International Studies, and member of the Warwick Q-Step Centre. He is currently involved in a number of European research projects on political trajectories, environmental politics and old and new social sciences methods. Dr Claire Crawford – Assistant Professor at the Department of Economics. Her recent research involves understanding what explains socio-economic and ethnic differences in Higher Education participation and attainment, and what universities and policymakers can do to help reduce these gaps. Dr Olga Goryunova – Associate Professor at the Centre for Interdisciplinary Methodologies. Her recent work involves questions about the digital subject/person in relation to data mining and an ESRC project on “Picturing the Social”. Dr Nick Sofroniou – Principal Research Fellow at the Institute for Employment Research. His recent work involves developing statistical models for complex samples in education and the social sciences, e.g., students nested in classrooms, employees in different countries, and longitudinal studies. He maintains a keen interest in evidence-based policy and in the interplay between national and international-level policy initiatives. Dr Emma Uprichard – Associate Professor at the Centre for Interdisciplinary Methodologies and co-direct of the Warwick Q-Step Centre. Her recent research explores how different methods, including big data analytics, can be developed for complex social policy and planning purposes. TO BOOK YOUR PLACE, PLEASE REGISTER ONLINE. This paper will address the ‘Voices of the University: Memories of Warwick, 1965-2015’ oral history project currently running at the University of Warwick, which aims to chronicle the memories and experiences of around 400 individuals who have worked, lived and studied at the university or in the surrounding area during the last 50 years. In particular Dr Wallace will explore some of the challenges involved in undertaking an institutional oral history project that, by necessity, must engage in a network of overlapping and competing communities. Whether interviewing current and former student, senior administrators, local residents or clerical and ancillary workers, the issue of ‘community’ become a significant factor in the way such a project is shaped, conducted and presented. Any attempt to identify a coherent ‘university community’ is destined to be problematic, and will necessarily open up issues relating to aspects such as sample selection, and how one adequately represents the inhabitants of a community that is, to use Benedict Anderson’s famous formulation, inherently ‘imagined’. Dr Richard Wallace is an Associate Fellow in the Department of Film and Television Studies and the project officer on the ‘Voices of the University: Memories of Warwick, 1965 – 2015’ oral history project currently running in the Institute of Advanced Study at the University of Warwick. He has research interests in film and television history and the practice and uses of institutional oral histories. The recent controversy surrounding Miley Cyrus’ provocative performance at the 2013 Video Music Awards has brought the discussion of girlhood to the forefront of popular culture. The commentators puzzled over the star’s transformation — reading Cyrus as both liberated and corrupt, honest and disingenuous —and their bafflement reflected the incongruities at the heart of the cultural construction of “the girl”. What is girlhood and how do we being to make sense of this label? The proposed reading group seeks to address these concerns. Designed to bring together Postgraduate researchers from across disciplines, the group will provide an open space for interrogating the diversity of frameworks and approaches to the study of girlhood. The meetings will take place every three weeks and the readings will be chosen collaboratively among materials suggested by the participants. The sessions will also potentially include screenings of films and other audiovisual materials. The introductory meeting will take place on Wednesday the 27th (Week 9) at 4pm in room 4 at the PG Hub. If you cannot attend at the specified date but would like to express interest in the group or for any further information, please email Marta Wasik at m.m.wasik@warwick.ac.uk. The group is open to all interested.